In recent years, all Russian political satires have gradually shifted to the Internet, though experts say Russian TV audiences want to see more. “Yes, Mr. President,” a new political sitcom on one of Russia’s main television channels, generated immediate interest in the mass media.This is hardly surprising, since the show’s hero is Vladimir Putin. The age of political satire on Russian TV is still fairly young, given that it began after the collapse of the Soviet Union in 1991. It kicked off with a few sketches onKVN(Russian initials for “Club of the Happy and Inventive”) — a popular game-show for young people done in the style of stand-up comedy. Even in the late 1980s, one would come across the occasional political parody of the last Soviet leader, Mikhail Gorbachev. Those first parodies were followed by parodies of Russia’s first popularly elected president, Boris Yeltsin. Perhaps the most striking political satire ever to appear on Russian television debuted in 1994. Called Kukly (Puppets), it was a licensed version of the French program Guignols de l’info, but with Russia’s own puppet politicians. 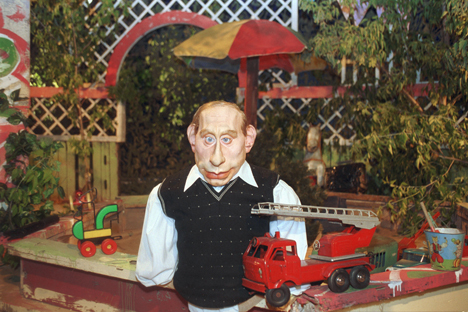 Thanks to the project’s main scriptwriter, satirist Viktor Shenderovich, the Puppets sketches were extremely pointed and topical. The show was an instant success and enjoyed high ratings throughout the eight seasons of its existence on NTV. In 2001, however, it was taken off the air after a change in management at NTV. Over the next decade, several attempts were made to revive the genre of political parody on television. Real Politics ran on NTV from 2005 until 2008; it included short computer cartoons with mild (compared to Puppets) satires of government leaders. In 2009, Russian TV’s Channel One launched the animation project Cartoon Characters, whose cartoon characters include Russian and foreign politicians and stars of show business. This show is still running, but, in the opinion of many experts, it is only an imitation of political satire. Viktor Shenderovich, the man behind Puppets, agrees. As the political-satire genre fell into decay on television, it became dramatically more active on the Internet, where several genuinely pointed and topical, political satires have appeared. Take, for example, the blog vladimirvladimirovich.ru, which regularly features short, absurdist stories supposedly from the life of Vladimir Putin. Meanwhile, in 2011-2012, the Internet video series Citizen Poet garnered enormous popularity. It paired Mikhail Efremov, the famous actor, with the no less famous poet, writer and journalist, Dmitry Bykov. Together they tackled the most sensitive subjects in Russian politics. Finally, there is KermlinRussia — a Twitter blog begun in 2010 as a parody of then Russian President Dmitry Medvedev’s own official blog. The parody, since its address differs from the official blog’s address by only one letter, gave rise to a number of amusing incidents when this or that media outlet mistook the satirical tweets for genuine tweets from the president and reprinted them. The recent launch of a political, situational comedy on Russian television may be an attempt to retain viewers. The Russian poet Alexei Tsvetkov — based in New York and also famous for a serious of short, satirical sketches about Putin and Medvedev — told RBTH that Russia’s main TV channels may be trying to keep part of their audience from the Internet, where it is of no use to advertisers. When asked if this new show would continue next season, NTV’s press service replied: “We do not comment on this project.” Still, TV viewers want to see more political satire. “Viewers are tired of the TV we have now,” said Boris Minaev, author of a biography of Boris Yeltsin. “They will happily accept any attempt to criticize the authorities.” After all, Minaev added, political satire allows one to breathe more easily and live more cheerfully.